My daughter Charlotte makes soft pretzels often. After I posted her recipe here, I decided I had to come up with a sourdough version to use up some of my extra starter. Sourdough deliciousness and food waste aversion all wrapped in one! Win-win! 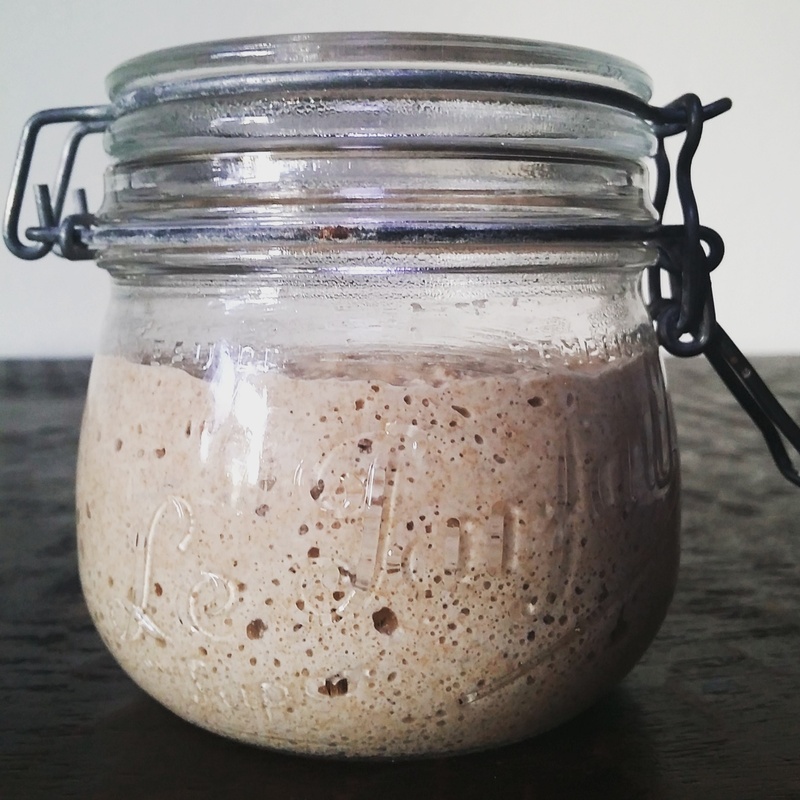 My sourdough starter consists of 50 percent flour and 50 percent water (100 percent hydration in sourdough lingo). I wanted to use 1 cup of this excess starter in Charlotte’s recipe. Because 1 cup of starter contains 1/2 cup of water and 1/2 cup of flour, I reduced the amount of water and flour each by 1/2 cup in Charlotte’s recipe. Sounds reasonable right? Well, four attempts later, it worked. Discarded starter will work for this recipe but the pretzels will turn out best if the starter has been fed within the last couple of days. Sourdough doesn’t like simple math. Substituting 1 part sourdough starter for 1/2 part water plus 1/2 part flour didn’t work as well as I had hoped. I had to play around with the amounts of flour and water in the recipe and adjust for other factors (see bullets below). I used too much flour in my first three attempts, which resulted in stiff dough and dense pretzels. Err on the side of too sticky. You can always add more flour as you knead the dough. Dough conditioners (dried ginger, citric acid) are your friends when you work with older starter. They help soften the dough. I added less than 1/16th of a teaspoon of each. Cheat and add some commercial yeast. Perhaps if I had just fed my starter, I wouldn’t have needed store-bought yeast. But the point of this exercise was to develop another recipe that would use up my discard. Baked goodies made with discarded starter tend to be on the dry side. Add some oil. Dissolve yeast and sugar in warm water and set aside for about 10 minutes, until yeast becomes foamy. Combine 2 cups white flour, whole wheat flour, salt and, if using, citric acid and ginger. When the yeast is ready, stir it and the sourdough starter into the flour mixture. Add more flour as needed to make a stiff dough. Turn dough out onto a generously floured work surface and knead by hand for about 7 minutes, until the dough is smooth and elastic. Form a ball. Grease the bowl with olive oil. Place dough ball in the bowl and turn ride side up to coat the entire ball in oil. Place a bowl over the bowl and set bowl aside, preferably in a warm spot in the kitchen. Let the dough rise for about an hour and a half, or until nearly doubled in size. Preheat oven to 475°F and grease two cookie sheets. Divide dough into 12 equal portions. Roll each portion into a rope, about 18 inches long and then twist into a pretzel shape. Lightly press the ends of the rope into the pretzel. Bring water to a boil in a pot and dissolve the baking soda. Drop in pretzels one or two at a time and boil for about a minute. Drain and transfer to a baking sheet. Sprinkle pretzels with salt. (You can also sprinkle them for cinnamon and sugar in lieu of salt.) Bake for 12 minutes or until golden brown. Remove from the oven and cool on a rack. PS A few summers ago in Upstate NY I had pretzel buns???? They were so good. They must be a thing. Would love to find a good recipe for them too. Maybe they are just pretzel dough made into rolls? They look yummy! Did the crusts simply burst open so evenly like that or did you slash them? Thank you 🙂 They burst when you plop them in the boiling water with baking soda. No slashing necessary. Thanks for sharing your recipe! Do you add the starter in step 1, with the yeast? Tried this recipe today. I think the amount of salt called out in the ingredients is off. Maybe it should be teaspoons? Pretzels turned out way too salty. Oh no! I’m sorry to hear that. I haven’t had this problem. Maybe you could move them to a higher rack and/or turn down the heat if you feel like trying them again. How long will these last after baking? Do they turn hard within a day? I made these today, they turned out amazing! Thank you for sharing the recipe!